Filling: Cast TNT: 60/40 Amatol; TNT and Wax. Filling: Cast TNT; TNT and Wax. Color: Field gray or aluminum overall. Dark blue stripe on tail cone. Construction: There are two types of the PC 500: Type E and Type L. Both types have a one-piece forged steel body and one transverse fuze pocket. The fuze pocket is located aft the horizontal suspension lug. The bomb is machined to accommodate a male type tail closing plug. The tail assembly can be either of sheet steel or magnesium alloy. The tail unit in either case is of the cylinder type. Both types have the sheet metal ring which is used for bracing the fins. The tail unit is secured to the bomb body by means of 12 screws. Suspension: Horizontal by means of an eyebolt or T-type lug. Color: Sky blue with aluminum tail. Blue stripe on tail cone. Construction: The body of the PC 1,000-kg armor-piercing bomb is of one-piece forged steel. The nose is very heavy and this construction decreases the size of the explosive cavity. There is one fuze pocket located aft the suspension lug. Through the center of the explosive cavity is an additional exploder tube. The tail unit is constructed of magnesium alloy and is attached in the same manner as used with the SC 1,000 series. Suspension: Horizontal. This bomb uses a suspension band with the H-type lug secured to it. At 90 degrees from the suspension lug in both directions are two trunnion bolts for dive-bombing. Color: Sky blue overall or sky blue with aluminum tail. Red or blue stripes on tail. Construction: The bomb body is of one-piece forged steel construction. There is one transverse fuze pocket located aft of the carrying lug. 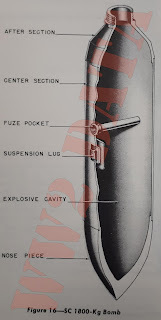 Two exploder tubes containing tetryl run lengthwise through the explosive cavity just left of the fuze pocket. The base of the bomb body is closed with a male base plate. The bomb tail is of the cylinder type, the cylinder being 6 inches deep. It is constructed of either cast aluminum or magnesium. Suspension: Suspension of the bomb in the racks is horizontal by means of an H-type lug or by two trunnions on the carrying band. Color: Blue stripes on tail. Construction: The body is of two-piece construction with a cylinder type tail. It is designed to penetrate 180mm of panzer steel or 2.5 meters of reinforced concrete at a striking angle of 60 degrees. Remarks: Usually dropped at an altitude of 4,000 to 6,000 meters. The production of this bomb was stopped in October 1942. Bombs then on hand were used and not replaced. Description: This series of rocket assisted armour piercing bombs consists of the following missiles; PC 500 Rs, PC 1000 Rs, and the PC 1800 Rs. In general, the three types are of similar three piece construction; the warhead, the distance piece, and the tail section. The tail section contains the rocket motor. Each series is fitted for horizontal suspension by means of a single "eye" or H-type suspension lug. In addition to the suspension lug, there is a set of trunnions fitted to the bomb. They are located 90 degrees around from the lug and approximately 2 inches further aft. The trunnions are used for suspension only under dive-bombing conditions. Warhead: The warhead is identical to the normal armour-piercing (PC) bombs of respective size except for the fuze pocket arrangement. In the PC-Rs series the transverse fuze pocket has been omitted. The impact fuze is part of the 49 series and is found screwed into the base of the warhead. The warhead is filled through the base and the explosive cavity is then closed by means of a male type base plate. Distance Piece: The distance piece is a steel cylinder internally threaded at both ends. Its main purpose is to connect the warhead to the tail section. The charging head for the fuzing system is threaded into the after end of the distance piece just forward of the tail piece junction. The electrical leads from the charging head pass through this cylinder; one to the impact fuze and the other to the pyrotechnic rocket igniter. Tail Section: The tail section is another steel cylinder with twelve stabilizing fins at the after end. This total of 12 fins is made up of 4 large fins and 8 smaller fins. The end of the tail unit is closed by means of a fixing plate. The fixing plate has six circular openings positioned so as to take the end of the venturi tubes from the rocket motor. The large opening in the center of the fixing plate will allow any gas emitted from the pressure release valve in the rocket motor to escape. Rocket Motor: The rocket motor is housed within the tail section. 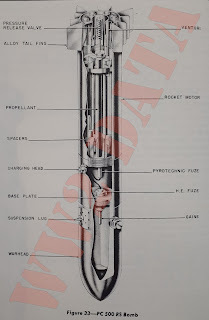 It consists of the following parts: main pressure chamber, six propulsion venturi, six metal spacers at each end of the pressure chamber to hold and properly space the propellant sticks, an igniter pad of black powder, and a spring loaded pressure release valve used as a safety measure. There are 19 sticks of rocket powder in each motor, dimensions of which can be found in the accompanying chart. The latest type of rocket powder used in these missiles was dinitrodiglycol. Operation: When the missile is released from the mother aircraft, an electrical charge is imparted to the charging head. This charge is passed on to both the pyrotechnic fuze and the electrical impact fuze. The pyrotechnic delay is ignited immediately. After 3 or 4 seconds it burns through to the black powder igniter. The black powder then ignites and starts the propellant powder in motor burning. The electrical charge which is passed on to the impact fuze loads and the condensers and arms the fuze. On impact one or all of the trembler switches close. This action completes the firing circuit and sets off the electrical detonator which in turn sets off the gaine and finally the main charge. Filling: Very pure cast TNT in an aluminum container in the nose. Rest of filling is alternate layers of good and poor quality TNT. PC 500 RS is stenciled in black on the side of the bomb. 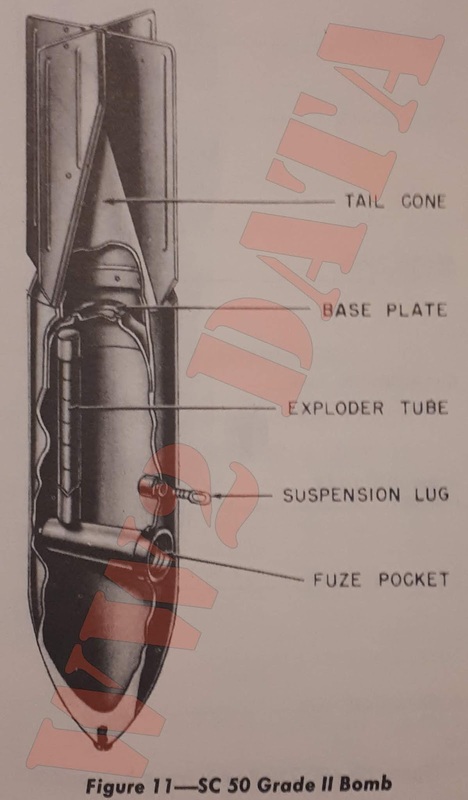 Construction: The rocket container is attached to the base of the bomb by a cylindrical steel distance piece which is threaded internally on both ends - one end threading over the bomb base and the rocket container threading into the other end. 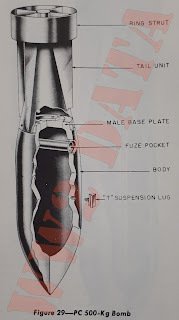 In the side of the distance piece is filled an electric fuze head marked (49) B1 with charging plungers connecting to (49) B11 and (49) B111 fuzes. Fuze (49) B11, a pyrotechnic fuze with a delay of 3 seconds is used for igniting the rockets. 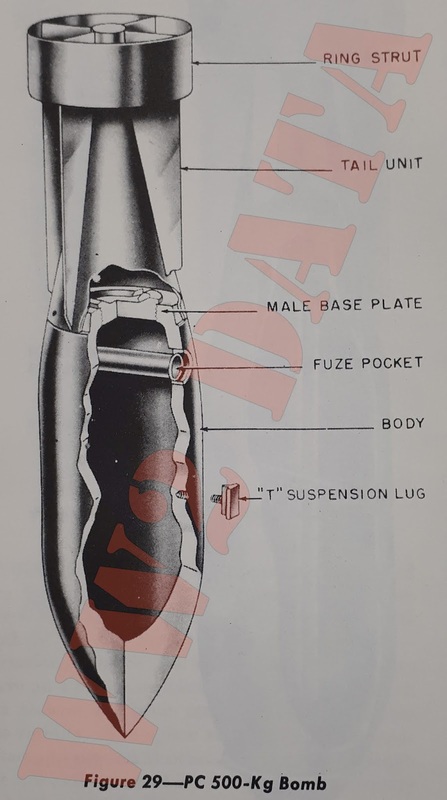 Fuze (49) B111 is an electrical impact fuze fitted into the base plate of the bomb, giving a fractional delay action to the bomb after striking the target. Nineteen rockets are placed in the rocket container. Twelve are 25 and 5/8 inches long by 2 and 1/16 inches in diameter, and seven are 27 and 5/8 inches long by 2 and 1/16 inches in diameter. Weight of rocket section is 146 kilograms. Color and Markings: Sky blue. Blue stripes between tail fins. The rockets consist of candles contained in a separate compartment at the base of the bomb and are held in position by spacers. This compartment forms a pressure chamber from which the gases generated by the candles escape through six propulsion venturi tubes. The tubes are sealed with pitch until combustion is effected. The pressure chamber is provided with a spring-loaded pressure release valve at the base. It is stated that the rockets burn for approximately 3 seconds after ignition and leave a trail of flame 150 feet long behind the bomb. The bomb is usually of A.P. 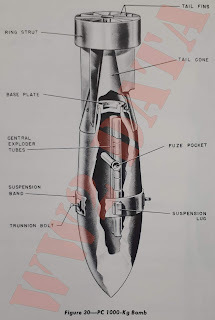 design, but instead of the exploder pocket lying transversly with the fuze head at one side, it is fuzed through the base plate which lies ahead of the rocket compartment. The pyrotechnic fuze ignites the rocket about 2.5 seconds after the bomb is released. Actually, bomb can be dropped without the rocket being ignited. Filling: Very pure cast TNT in an aluminum container in the nose. Two pre-cast Trialen charges in thick cardboard cylindrical cartons which are waxed into the bomb casing, completes the filling. One specimen had 3 blocks of nitroguanidine in the nose and 10 blocks of RDX/Wax/A1 in two cardboard cylinders in the body. Color and Markings: Bomb body and tail are sky blue in color. Rocket unit and distance piece are olive drab. Construction: Typical rocket bomb construction with single fuze pocket in distance piece. Nineteen rockets are used: ten 22 and 1/2 inches long, eight 20 and 7/8 inches long and one 11 and 1/4 inches long. All have a diameter of 2 and 15/16 inches. Rocket unit weighs 422 kilograms. Color: Bomb is dark green overall and tailcone is striped with red. Construction: The body of the SD 50 is a one-piece steel casting. When machined down it has provisions for one transverse fuze pocket just forward of the horizontal carrying lug. It is threaded at the base to accept a male type filling lug. Either the Type 1 or Type 2 tail assemblies can be used. Type 1 has a cast alloy adapter with sheet steel vanes. The four vanes are not supported by struts. Type 2 is a one-piece construction assembly of cast magnesium alloy with no strut supports for the tail fins. In addition to the horizontal carrying lug, there are threads machined in the nose to take an "eye" type lug for vertical suspension. Remarks: A small angle iron kopfring is normally fitted to the bomb. 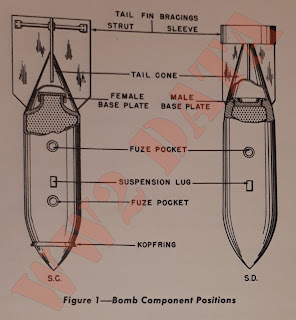 In addition to the kopfring a 24-inch dinort rod may be added to obtain penetration detonation of the bomb. 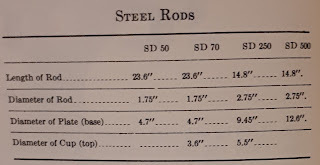 An extension rod used with the (55) A can be used for the same purpose. When the bomb is used against water targets, the tail fins are removed. It is claimed that the ballistics are not changed by removing the tail fins providing the dropping range is less than 200 meters. The E1AZ (38) fuze with a maximum delay of 5 seconds allows for water travel of 12 to 18 meters. Color: Bomb is field gray overall. Red stripes on tail fin. Construction: The SD 70 body is of one-piece forged steel and is normally fitted with a kopfring. The tail is of sheet steel construction and the fins are ribbed to supplant the diagonal fin braces. This bomb, on occasion, is fitted with a parachute. The tail unit is removed and a sheet metal cylinder 18 inches long and 7 and 3/4 inches in diameter is attached to the base of the bomb. Contained in the cylinder is a red lattice type parachute 5 feet square with four double shroud lines. The shroud lines are secured by means of four U-shaped brackets to a collar over which the base plate screws. The overall length of the cylinder and bomb is approximately 45 inches. Suspension: Horizontal or vertical suspension is used. 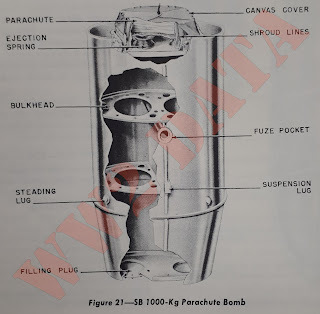 Remarks: Parachute bomb apparently designed to give air burst. Color: Bomb body and tail are painted dark green, sky blue, or aluminum. Tail cone is striped with red or blue. Construction: Bomb is of three-piece construction. Nose and tail pieces are welded to main part of body. One fuze pocket. A female base plate is used. The tail is of sheet steel construction. Four vanes are welded to a cone. There are also box-type struts of bar steel. Extension cylinder has a dummy fuze head. Construction: Stabo bombs have a threaded lug forged to the nose of the case. Stabo spikes screw on to this threaded lug. The same spike fits both SC 50 and SD 70 and is of one-piece construction. The SC 250 and SC 500 Stabo spikes have an additional piece, a pressure plate, which fits between the bomb case and spike to increase the rigidity. The spikes are used in low altitude attacks to prevent ricochet. A 1-cm hole through the spike allows use of a bar to screw spike securely to bomb. Remarks: Stachebomben, or "Stabo" for short, are used in low altitude attacks to ensure the bomb does not ricochet. The SC 250 and SC 500 are both two fuze pocket bombs and fuzing is usually a time fuze 17 or 57 and an antidisturbance fuze (50). 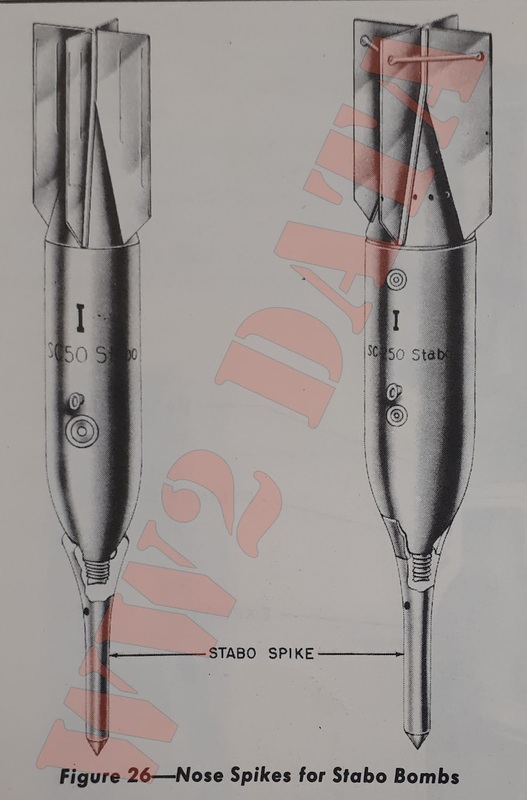 The SC 50 Stabo and SD Stabo are normally fuzed with a (55). Discs fitting on the end of these spikes have been found. It is thought nose switches have been used to give instantaneous action. Color: Field grey overall with red stripes on cone. "D500 stg" stenciled on body in black. 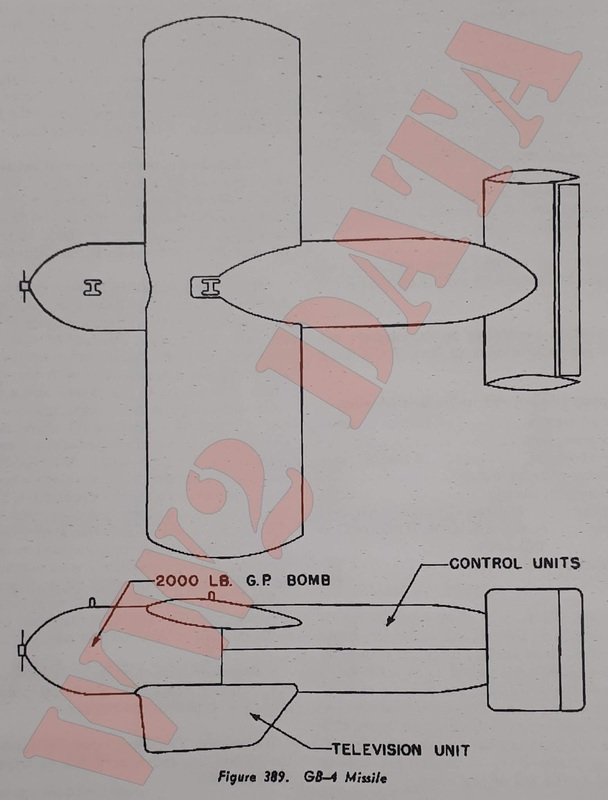 Construction: All bombs in the SD 500 series are of one-piece drawn steel construction. The main difference between the three modifications is the variation in wall thickness. One transverse fuze pocket is located aft the suspension band. 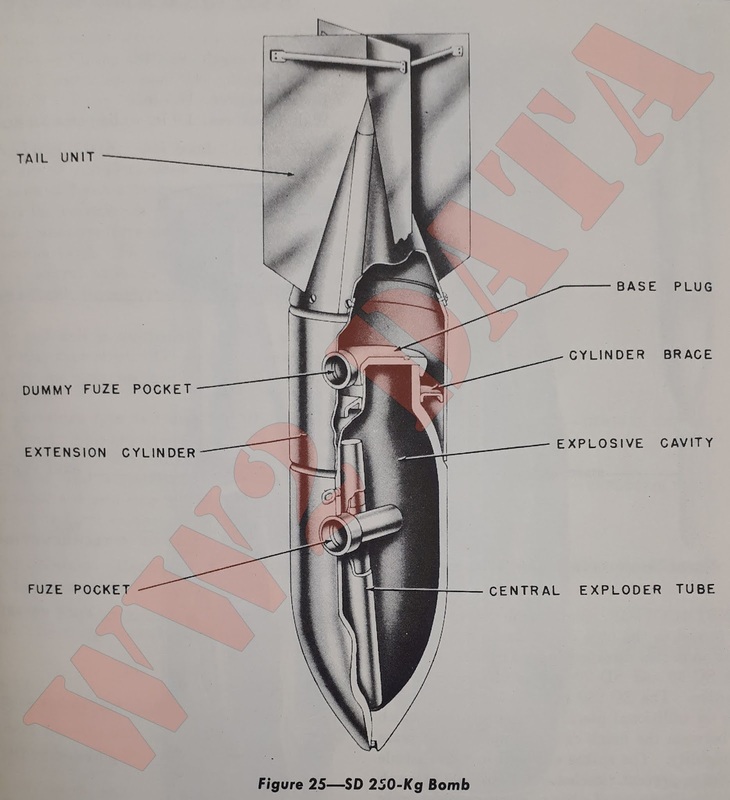 To insure high order detonation, a central exploder tube has been inserted longitudinally through the explosive cavity. The tail unit is constructed of sheet steel and has a ring type strut. The unit is secured to the bomb in the same manner as the tail on the SC 1000 bomb. Suspension: Horizontal, by means of an H-type lug secured to a suspension band. Color: Black or sky blue overall. Red stripes on tail. "D1700" stenciled on opposite sides of body in letters 40mm high. Construction: Body is of one-piece, forged steel construction. A single fuze pocket is used with an extension cap fuze in the nose. The base of the bomb is threaded to take a normal female type base plate. A cast steel kopfring is welded to the nose as a preventative against excessive penetration. The tail is made of light alloy and is of the cylinder type. The 8-inch wide band is attached to the fins by rivets. This band is known as a ring-type strut. Suspension: Horizontal, by means of an H-type lug. 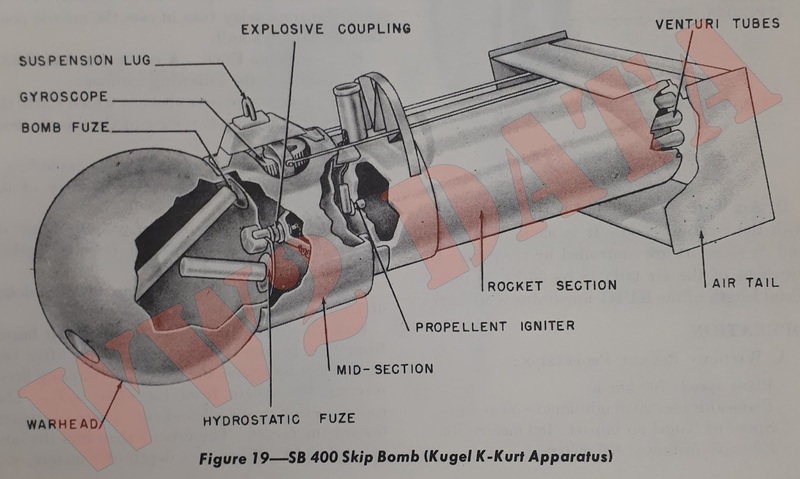 Description: The German "KURT" apparatus is a spherical, hydrostatically operated, aircraft-laid, skip bomb; a copy of a similar device used by the British. It was designed to operate like a skipping stone over a smooth water surface for use against ship targets, power plants, lock gates, tidal installations and similar harbor facilities. The information contained in this report was obtained through the interrogation of German scientists and prisoners of war. Complete specimens of this device have been shipped to the United States Nay Ordnance Investigation Laboratory. Development of the "KURT" apparatus was commenced in the late 1943 at the German airforce experimental center (E-Stelle), Travenmunde, Germany. The original model was a sphere approximately 30 inches in diameter and weighing 400-450kg. 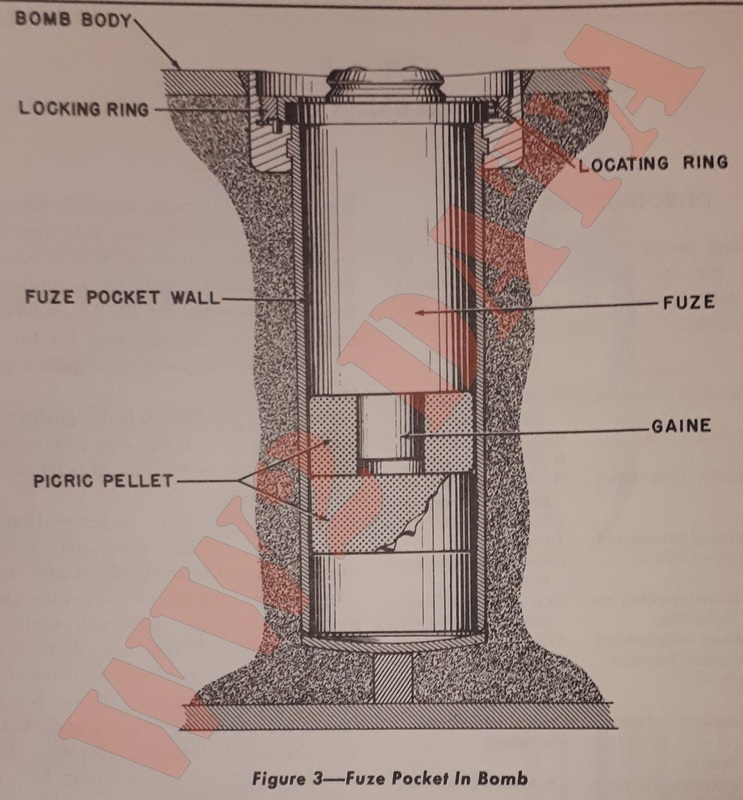 It contained two fuzes; one, a type 59 fuze with a 23-second powder delay train, and the other, a hydrostatic, type 44 fuze. The effective range of this spherical missile was calculated at 400 meters. To increase the range to 4,000 meters a rocket propulsion unit was fitted to the sphere. Some experiments were carried out with the propulsion unit but no actual tests were made. Work was stopped on this device in August 1944 when efforts were directed to more advanced projects. Because of the scarcity of documents and test datum it is impossible to substantiate adequately the information obtained through interrogation. The first experiments were carried out with a model having the same weight and dimensions as the final "KURT" warhead. The ideal altitude for the attacking plane was calculated at 20 meters and at a speed of 700km/h. It was found that under ideal conditions, the missile had an effective range of 400 meters. To increase the range and to offer more protection for the attacking aircraft, a rocket propulsion unit was added. The modified "KURT" with rocket assistance included an air tail with its elevators preset to an angle of 10 degrees to prevent sharp trajectory as in the case of the sphere without rocket assistance. (Because of the essentially shorter running distance of the sphere without rocket assistance, sharp trajectories and slight deviations from the target course were disregarded.) 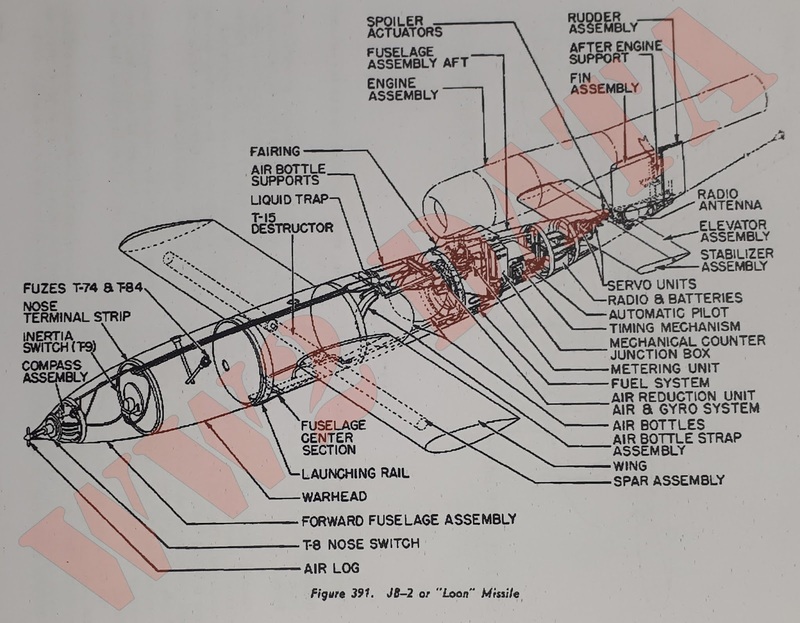 This modification proved unstable in flight because the assembly tended to rotate about its longitudinal axis, deviating from the target course to such an extent that the target would be missed completely. To obviate this large deviation and to give the missile directional stability, a gyroscope was installed. However, no further tests were made. The warhead, a spherical shell, is filled with cast hexanite and contains two fuze pockets. 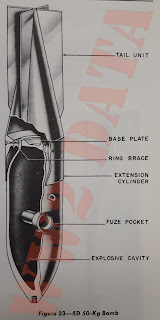 A transverse pocket, housing two KRUPP hydrostatic fuzes which replaced the type 59 fuze, runs through the sphere and is open at both ends. The other pocket is set at an angle of 45 degrees to the transverse pocket and contains a type 44 hydrostatic fuze. The cylindrical mid-section houses a gyro unit which is operated by a gas evolved from a burning element. It also houses the lifting lug and the explosive coupling which severs the warhead from the propulsion unit. The rocket section is a steel cylinder 18 inches in diameter and 36 inches long. It houses the rocket propellant and 18 venturis. The weight of the propellant is approximately 90 kg. The air tail is the same as used with the bomb-torpedo. It is made of plywood and its elevators are controlled by the gyro. Dimensions of the air tail: 18 by 36 by 50 inches. Total length of the KURT apparatus is 80 inches. Under ideal conditions the Germans considered the Kugel without propulsion 100 percent accurate at a range of 400 meters when dropped from an altitude of 20 meters at 700km/h. If the missile was dropped from heights greater than 50 meters or at speeds less than 700km/h the effective range was decreased due to deviations from the target course. Rough waters also caused serious deflections which could not be controlled. 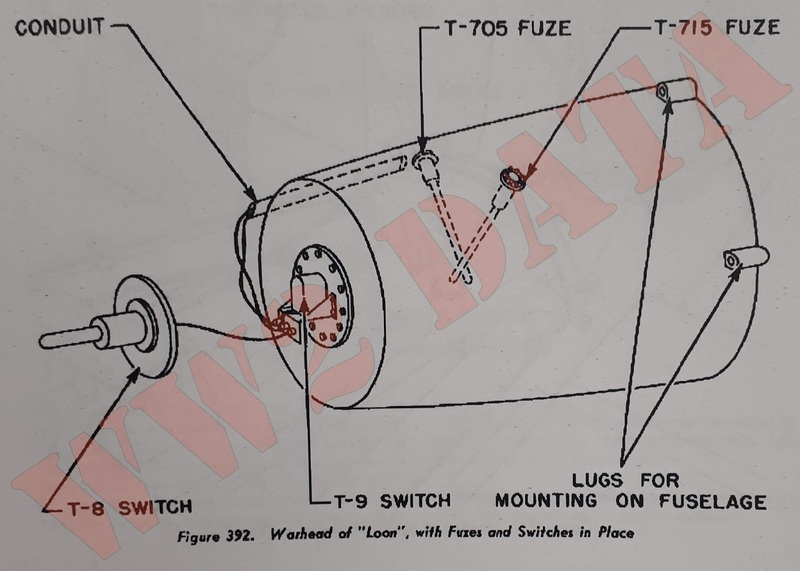 In the original Kugel without propulsion, two hydrostatic fuzes were used; a type 59 fuze that was designed to operate after a delay of 23 seconds, and a type 44 fuze designed to operate at a depth of 8 meters. 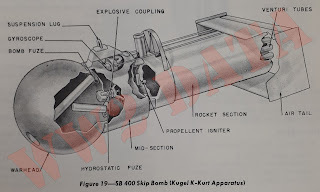 The sphere was later modified to accommodate two Krupp fuzes for normal hydrostatic operation at 8 meters, and an electrical time delay fuze in case the missile penetrate the ship's hull. 1. Ignites an explosive element which starts the gyro immediately upon release of the missile from the plane. 2. Ignites the rocket propellant by exploding a 1-kg black powder charge after a delay of 0.5 seconds. 3. 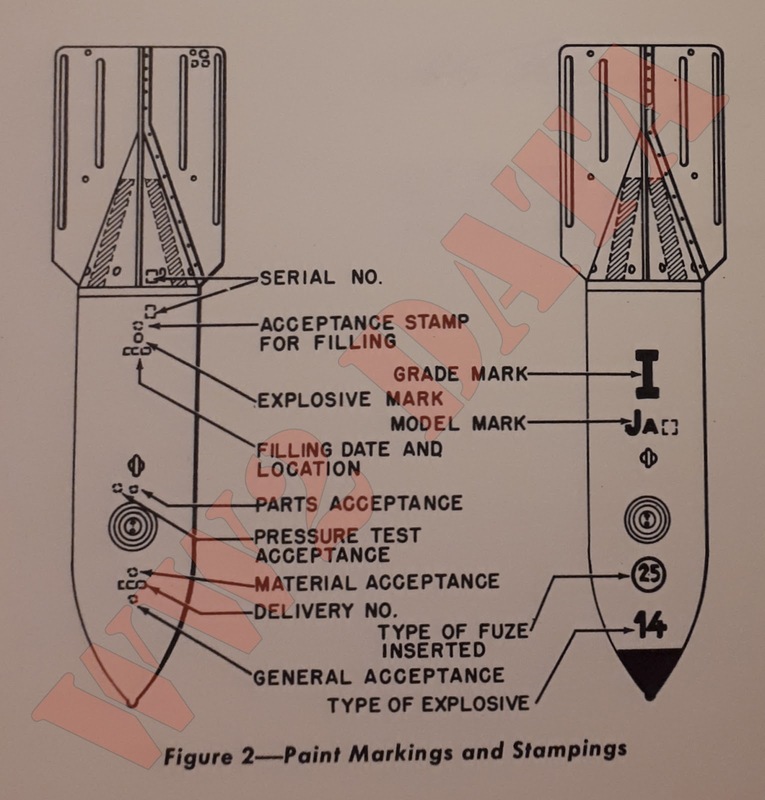 Allows either one of two possible types of electric fuzes used, to be armed. 4. Fires the explosive coupling after a delay of 4.5 seconds. When the rocket propellant is ignited it burns from 3 to 4 seconds. One-half second after the rocket impulse ceases, the explosive coupling fires, severing the sphere from the after body. The rocket section drops off and the sphere continues toward the target. The missile then hits the target and sinks. 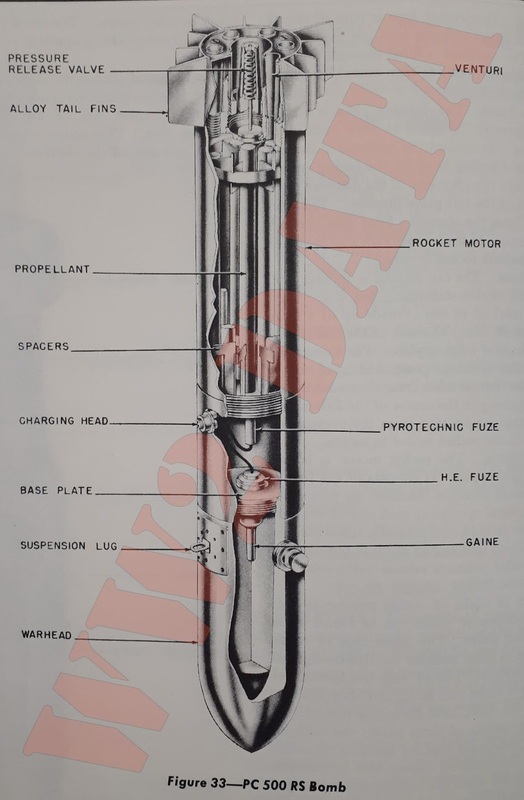 When at a depth of 8 meters, one of the hydrostatic fuzes is actuated to fire the main charge. Construction: The bomb has a welded sheet metal body. A drawn steel threaded nose piece is of streamlined construction to reduce air resistance while the bomb is attached to the plane. (Earlier models had a welded nose piece.) There is no base plate. 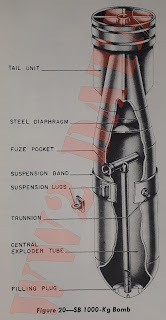 The bomb is filled through the nose and an exploder tube runs along the central axis from the fuze pocket to the nose. It is filled with TNT pellets. 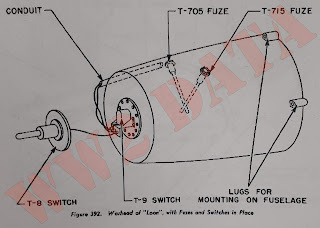 Electric leads run through the center of the bomb connecting fuze and nose switch. Bomb has a drawn steel cone-type tail. Suspension: Horizontal by H-type lugs or trunnions for use if carried by dive bombers. Remarks: Due to its thin case and brisant explosive, this bomb is sensitive to small arms fire. 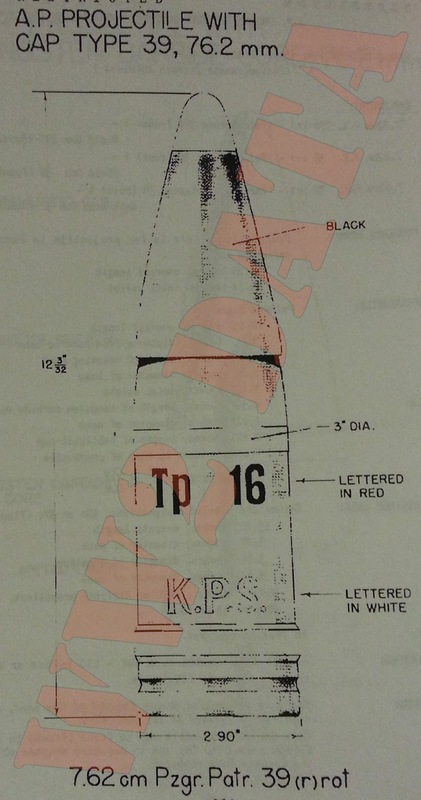 Color: The bomb casing is painted field gray with the following markings stenciled in black along the body. Construction: The parallel sided body of the SB 1000 is made of steel plate and is roughly elliptical in end section. It is formed by two halves which are welded together externally. 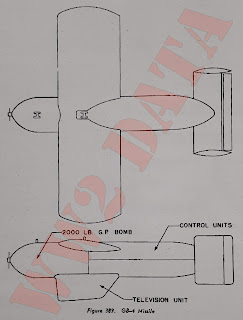 The bomb body is strengthened by a longtudinal bulkhead and two perforated diaphragms all welded into position. The base plate is welded into the body 2 and 1/2 inches from the end. The recess so formed is used to house the parachute container. The fuze pocket is welded into a slot in the longitudinal bulkhead. Nose plate is welded into position and has in it filling holes. There is a nose extension in the center of the nose plate which houses the impact switch 55 A/M fuze. 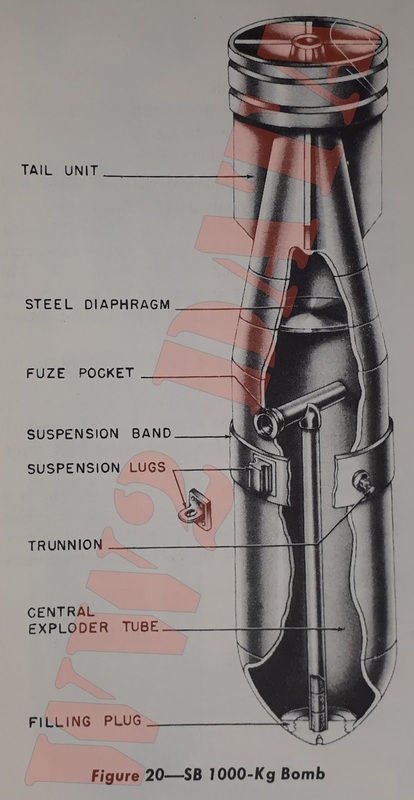 The fuze pocket is connected to the impact switch by two wires which are house in a metal tube. The parachute container, a thin metal box, is positioned between two ribs riveted to the base plate. It is secured to the base of the bomb by bolts. Inside the outer box an inner container is welded to the base of the outer box. Four extension springs are secured to the base of the inner container and are also attached to a plywood platform which is the base for the parachute. The parachute is folded on the plywood, the platform depressed, compressing the spring then held in place by canvas flaps secured over the top. The under flap carries a loop of cord which is threaded through eyelets of the other three flaps, a quick release pin is passed through the loop, thus retaining assembly against action of the spring. Operation: On release from the aircraft the quick release pin is withdrawn from the loop by a time parachute release which can be set for delays of 2, 3, 4, 5, or 6 seconds. This device obtains its delay by means of a spring and cog wheel. The parachute is of coarse weave vegetable matter. Red, green, and blue parachutes have been found. There are 16 double parachute shroud lines. It has been assumed that the figure "410" refers to the type of aircraft by which the bomb is carred. ME 410. Color: Sky blue overall. Two yellow stripes are painted on the body between the tail fins. SB 2500 is stenciled on the body. Construction: The main difference between this and the SC 2,500-kg type Max are: the construction is of steel instead of aluminum alloy and the filling extends into the tail cone with the object of keeping the charge/weight ratio as high as possible. The case is constructed in three parts, a cast steel nose, with a cast steel base welded to the cylindrical body. 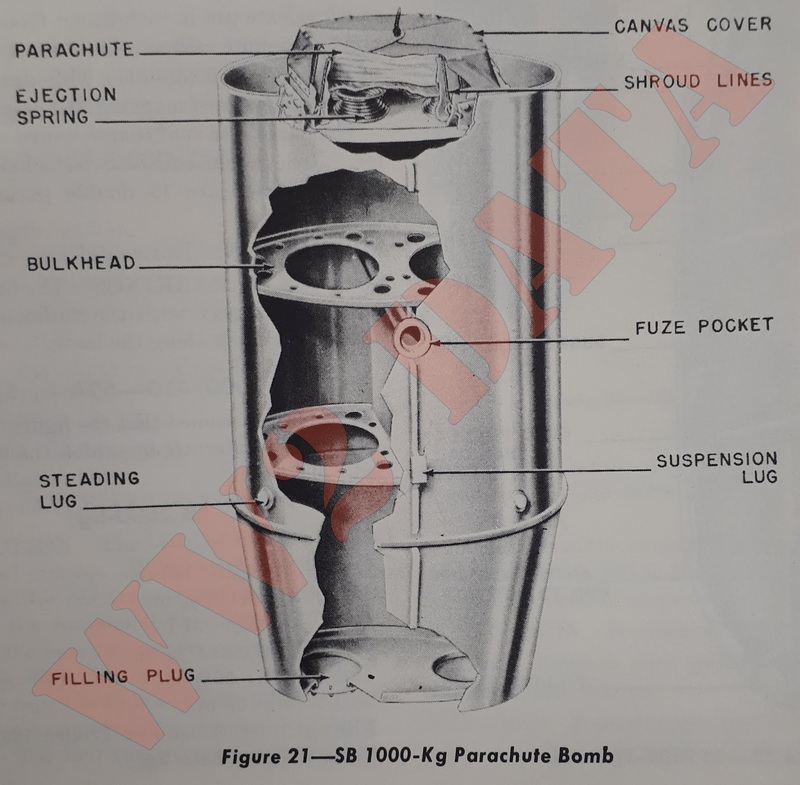 The nose of the bomb is fitted with a filling plug to which is fitted a tube extending to the forward fuze pocket, the tube houses a rod which on impact crushes the impact fuze and activates the bombs. 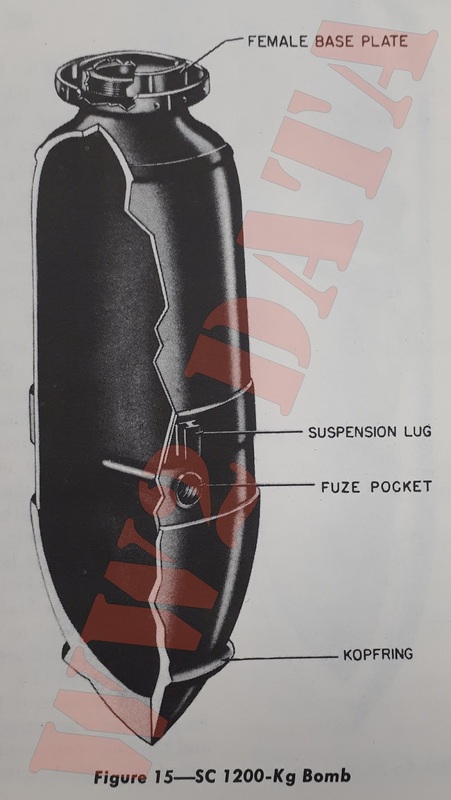 There are two transverse fuze pockets; the forward pocket houses the anti-break-up fuze and the after pocket is for the normal impact type fuze. The tail unit is a four fin drum type. The cone portion is sheet steel and the fins and tail drum are constructed of alloy. Suspension: Horizontal by an H-type lug. The suspension lug is keyed to a securing plate locked by bolts. Color: Sky blue overall with a yellow stripe on the tail cone. Construction: The SC 1200kg bomb is very similar in construction to the SC 1000 series. The body is a drawn steel tube to which has been welded a heavy cast steel nose. The after end of the body is constructed to take a female base plate. There is one transverse fuze pocket located off the suspension lug. A Kopfring is welded to the nose. The magnesium alloy tail unit is similar to that on the SC 1000 series and is secured to the bomb in the same manner. Suspension: A suspension band is placed around the body of the bomb at the center of gravity. Secured to this band is an H-type suspension lug. Color: Sky blue overall with yellow stripe on tail cone. Construction: The SC 1800kg bomb has the same general construction as the SC 1000 and SC 1200 series. It is fitted with a single fuze pocket. The tail unit is constructed of sheet steel. The four fins are braced with diagonal bars on the SC 1800 model and with the ring type brace on the SC 1800B model. The SC 1800 series has the central TNT exploder tube like the SC 1000. Suspension: Horizontal, using the H-type suspension lug. Color: Dull black overall in color. Markings stenciled in white. There is a 4 and 1/2-inch yellow band painted about half way down the body. Construction: The entire body is forged into one piece and is machine finished externally. A triangular ring (Kopfring) is welded on the nose to prevent excessive ground penetration. A 5/8-inch plate is welded inside the casing beneath the H-type suspension lug to act as a stiffener. The bomb contains one transverse fuze pocket located just aft of the suspension lug. A 2-inch diameter steel bar with threaded holes in each end also runs transversely but at right angles to the fuze pocket. These holes receive the detachable trunnion screws which are used only for dive bombing. A dished tail retaining ring containing 24 holes is welded to the bomb casing near the base. Twelve small screws affix the tail assembly to this. The tail is made of 3/32-inch sheet steel. Each fin and cone segment is formed from one pressing and the four components are welded together. A closed cylindrical container 6 and 1/2 inches long and 3 and 5/16 inches in diameter is located in the center of the tail assembly aft of the tail cone. This is closed at the rear by a threaded male plug with a conical spring mounted on its inner side. The dive bombing trunnions are stored in this space until and if they are to be used. Suspension: Horizontal, H-type lug, or by trunnions. Trunnions screw into the sides of the bomb 90 degrees from the carrying lug. Filling: Trialen 105; 40/60 Amatol mixture of RDZ, TNT, and aluminum. Color: Sky blue overall. SC 2500 is stenciled on the body in letters 3 inches high. Two yellow stripes are painted on the body between the tail fins. A few anti-shipping bombs have been found with the following stenciled on the body: "Bei Abwurf auf land nicht im Tiefangrift und nur o. V." (Not to be released from a low height on land targets; always nondelay.) This type is thought to be filled with Trialen 105. Construction: The SC 2,500 has an aluminum body with a welded head and tailpiece. There are two welded fuze pockets. The rear fuze pocket is in the plane of the suspension lug. The forward pocket is rotated about 30 degrees tot he right. This pocket is connected to the nose of the bomb by a tube which extends a break-up functioning rod. This rod, which is central to the axis of the bomb, will on distortion of the nose crush the lower section of the fuze to explode the bomb. A kopfring is welded to the nose. The tail of the SC 2500 is aluminum and of the drum type. Suspension: Horizontal by an H-type lug. A suspension band is placed around bombs to give a solid base for the suspension lug. Construction: The Bi is a one-piece cast steel body machined down. All the fittings are welded in place. It is very similar to the Ja and L series. The bomb is threaded at the base to take a male base plate. A steel diaphragm with a central hole is located 3 and 3/4 inches forward from the base plate. When the bomb is loaded, the filling charge comes only to this diaphragm. The tail cone is sheet steel constructed in four pieces, and welded together. The assembled cone is secured to the bomb by means of eight screws. There is one transverse fuze pocket located forward of the horizontal suspension lug. The bottom end of the pocket is secured to the opposite wall by a weld. It is long enough to accommodate the normal sized electric fuze and two picric pellets. In the nose female threads take an eye bolt for vertical suspension. The bomb may include a shock plate welded to the nose to help prevent ricochet when used against water targets. Yellow stripe on each segment of cone. Construction: The Ja has a one-piece drawn steel body. The L is the same as the Ja except the body is of seamless tubular steel. The Stabo is like the Ja, with a threaded lug forged to the nose of the bomb. A steel spike 18.5 inches long, 1.8 inches in diameter, can be secured to this lug. The sheet steel tail cone is secured to the bomb body by eight screws. More recent models have a collar welded around the neck of the bomb and the tail cone is secured to this collar by screws. The holes in the tail fins are used when screamers are attached. Bombs can be modified for use on water targets by removing the tail fins. It is claimed ballistics are not changed up to an altitude of 200 meters. Its maximum delay of five seconds allows 12 to 18 meters of water travel. When water targets are the object of an attack an anti-ricochet plate is bolted to the nose. This permits a much smaller angle of impact without ricochet. Suspension: Horizontal or vertical by an eyebolt. Construction: The JB has a one-piece nose and body. The base is welded to the body. The JC has a pressed steel nose and drawn steel body. Here the nose and base are welded to the body. The J was the early model of the JB and they are identical in construction. The J/2 is very similar to the JC, the quality of the steel being the real difference. It was produced only in limited quantities. The sheet steel tail cone is riveted to a ring which is secured to the bomb body by eight screws. The small holes on the fins are used to attach screamers. Grade II can also be modified for use against water targets. Same modification and results as for Grade I are claimed. Suspension: Either horizontal or vertical. TNT and wax or woodmeal and aluminum powder and naphthalene and ammonium nitrate. Color: Field grey, sky blue, or aluminum overall. Yellow stripes on the tail. Type 1: Includes Models J, L, and L2. J is of one-piece construction forged steel; L is one-piece construction tube steel; L2 is two-piece construction, nose forged steel, body tube steel. Type 2: J is two-piece construction forged steel. Type 3: Includes Models J, B, and K. J is three-piece construction; nose, forged steel; body, tube steel; and base, forged steel. B is three-piece construction; nose, cast steel; body, tube steel; and base, arched case steel. K is three-piece construction; nose, case hardened steel; body, tube steel; and base, cast steel. Suspension: Suspension is either horizontal or vertical. Remarks: The L2 type is sometimes equipped with a spike making it detonate above the ground. Spike is 22 and 1/2 inches long and 3 inches in diameter. Color: Field grey, sky blue, or aluminum body with yellow stripes on the tail cone. When a merchant ship silhouette is stenciled in yellow on the tail cone, it indicates Trialen (105) filler. Construction: The SC 500-kg Grade III bomb is constructed in three sections: nose piece, center section, and tail closing assembly. The steel nose is cast and machined to the proper dimensions, and then welded to a drawn steel tube known as the center section. The tail closing assembly consists of a sheet steel dome, and a steel connecting ring. The flat steel connecting ring is riveted to the outside of the dome, and then the whole assembly is secured to the after end of the center section with 16 countersunk bolts. The tail assembly is placed in this position only after the bomb has been filled with explosive. There are two transverse fuze pockets in this series. 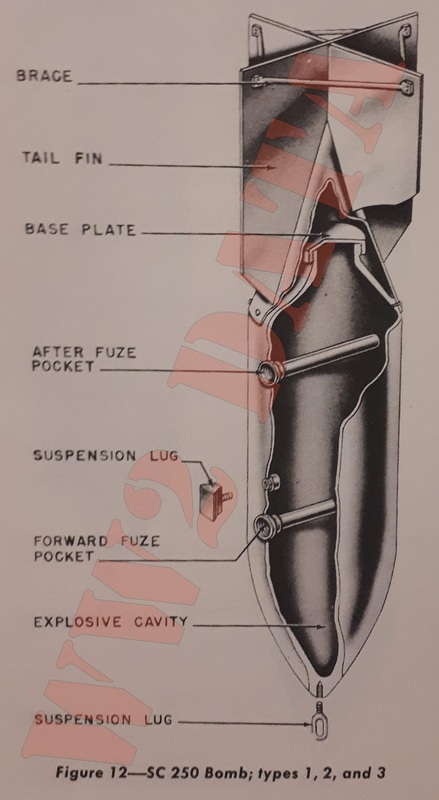 The forward pocket generally contain sthe impact fuze and the after pocket has either a type 17 time fuze of a type 50 anti-disturbance fuze. 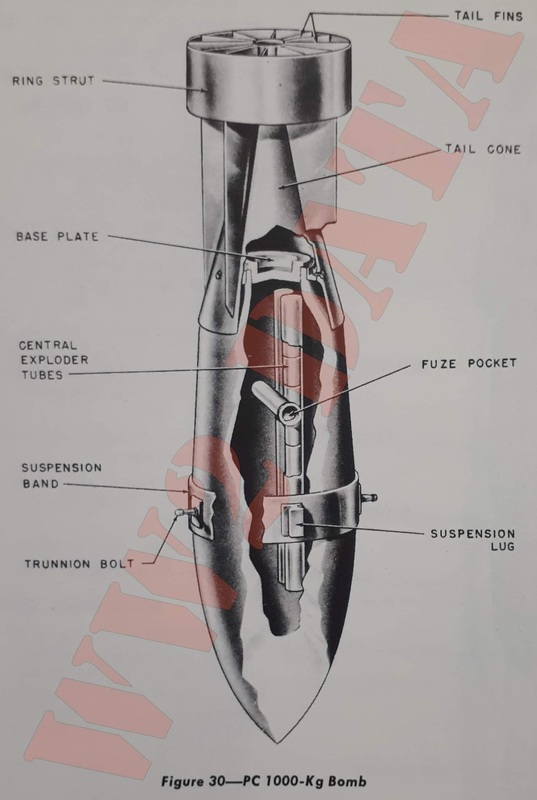 In case the bomb is to be used in anti-submarine work, the forward fuze pocket will contain a type 38 fuze. A kopfring will also be added for this type of work. Suspension: Horizontal only by means of an eyebolt. Remarks: Bombs recovered with Trialen filling have cylindrical paper wrapped pellets 1 and 15/16 in. in length and diameter forming a column along the main axis of the bomb. These pellets are composed of RDX/Alum/Wax. Some bombs have approximately 500 pellets in addition distributed throughout the filling. Color: Sky blue with a yellow strip on the tail cone. Construction: The SC 1000 and SC 1000 L2 general demolition bombs have a drawn steel tube body. A very heavy constructed pointed nose is welded to the forward end of the drawn steel body. The after end of the bomb body is threaded to take a female base plate. The tail attachment brace is tack welded to the body just forward of the base plate. The magnesium alloy tail unit is of welded construction and is equipped with ring type struts. The unit is secured to the bomb body in two ways; it is welded directly to the bomb where the base of the cone contacts the body, and it is also bolted to the tail attachment brace with 16 round head bolts. This series of bombs are equipped with only one transverse fuze pocket. It is located approximately 8 inches off the suspension lug, and usually contains one of the EL A Z (55) series fuzes. 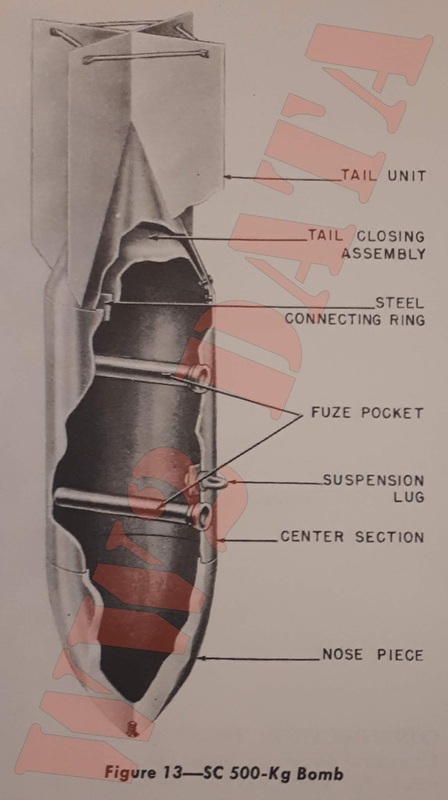 In addition to the booster pellets in the transverse fuze pocket, a central exploder tube of high grade TNT is located in the center of the explosive cavity. This tube runs almost the entire length of the cavity and is used to insure high order detonation. 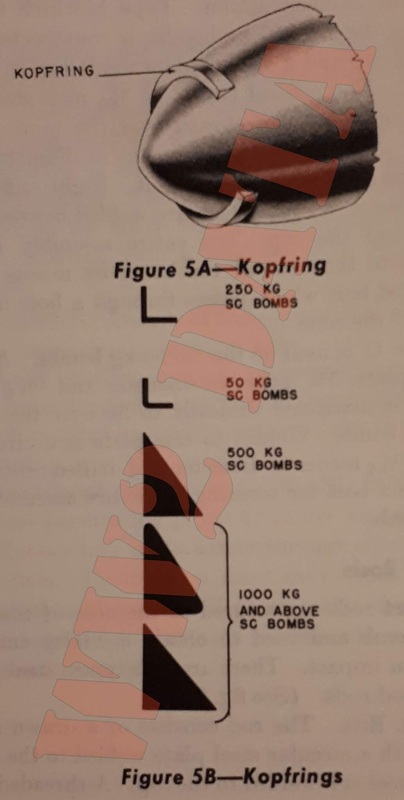 The nose of the bomb is always fitted with the large-size kopfring. Suspension: Horizontal by means of an H-type lug. Remarks: When filled with Trialen (105), in place of yellow stripes on the tail cone, a silhouette of a ship is stencilled in yellow paint. On the bomb body is stencilled "nur gegen handelschiffen" (use only against merchant ships). It is stated that against non armour-plated targets it gives off a good mining and blast effect, also good underwater results. Low level attacks using this bomb cannot be made because of the lack of safety for the releasing plane. 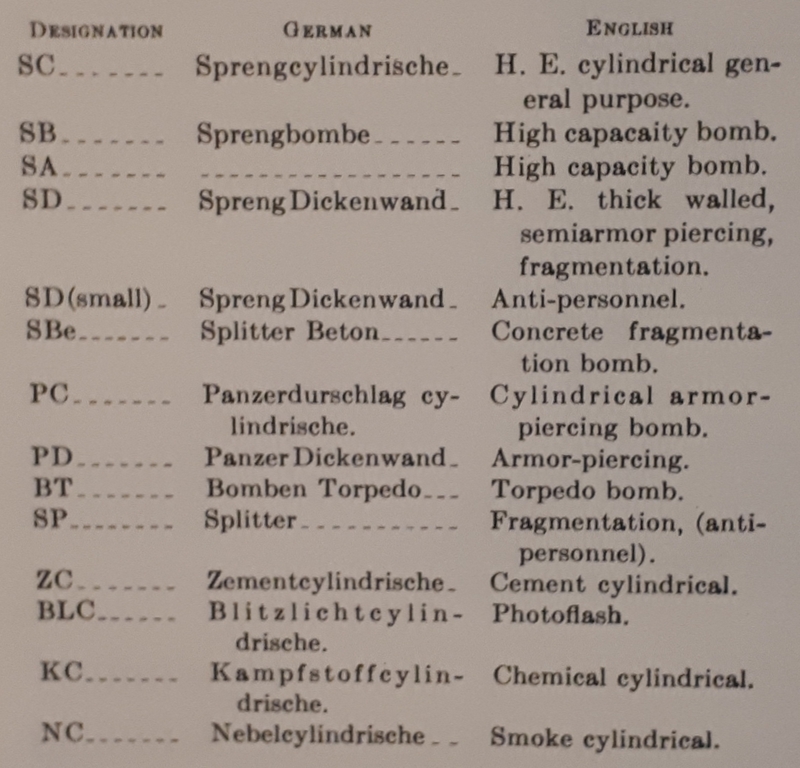 The following list gives the abbreviated designations used for the identification of German bombs, the full German designation and the English equivalent. 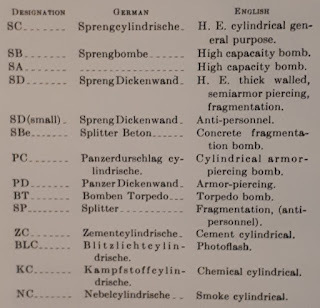 -"Panzer Cylindrisch" or armor piercing bombs. 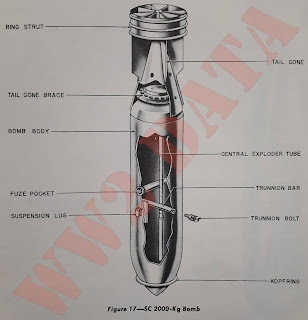 In addition to these three general types there are: SB and SA types of bombs for maximum blast, SBe concrete bombs, PD armor piercing bomb and the BT (Bomben Torpedo) bomb. The SC or general purpose bombs are used primarily for general demolition work. 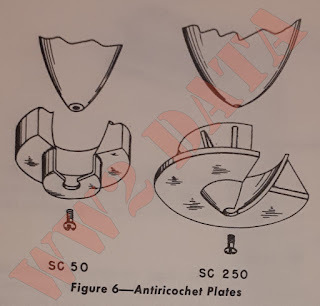 The SC 250 and SC 500 may be fitted with two athwartships fuze pockets instead of the usual one. These two bombs are usually associated with time and protective fuzing. The other SC bombs are fuzed either instantaneously or with a short delay. SC bombs have thin parallel walls with a comparatively heavy nose. Usually they are of three piece welded construction. SC bombs have a loading factor of approximately 55 percent and are filled in most cases with cast TNT, powdered amatol or trialen. 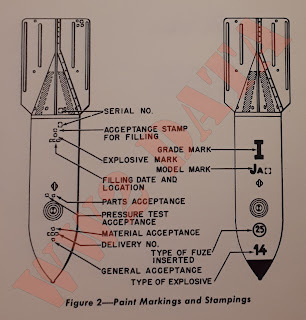 Bomb identification for the SC type is made easy by the presence of yellow paint on the tail cone. The SB type of bomb is designed to give maximum blast effect. It has very thin walls and loading factors run as high as 80 percent. Fuzing is instantaneous. SD (small antipersonnel bombs). A special grouping of these is desired, for they are a very distinctive group and not just a miniature model of the larger type. Bombs have thick walls and a low loading factor. A mechanical instead of electric fuze is used in most of these bombs and bombs are usually carried in containers. SC bombs of this type are so designated, but it seems they might more correctly be called SD to keep classification uniform. SBe or concrete bombs are used for the same purpose as SD's/ They have thick concrete walls reinforced with steel. Loading factor is around 20 percent and a low power explosive is normally used. The PC or armor-piercing bombs are used primarily against ships and fortifications. They are fuzed with a short delay for penetration. PC bombs are slightly streamlined with a heavy nose and thick walls. The thickness of the walls decreases toward the base of the bomb. They are made of cast steel and the nose is specially hardened. PC bombs have a loading factor of approximately 20 percent and are filled with a TNT wax mixture. PC bombs may be identified by the presence of dark blue paint on the tail cone. PC bombs have been used as SD's for fragmentation and fuzed instantaneously; if so, the dark blue may be over-painted with red. The PD is even more exclusively armor piercing. Bombs are thinner, longer, have thicker case and a lower loading factor. BT. The BT (bomben torpedo) was put into production during the last 2 months of the war, but was never used operationally. It is designed along the lines similar to a torpedo except for the after section where there are three large tail fins. The missile has no propulsion except that induced by gravity and the forward motion of the mother aircraft. 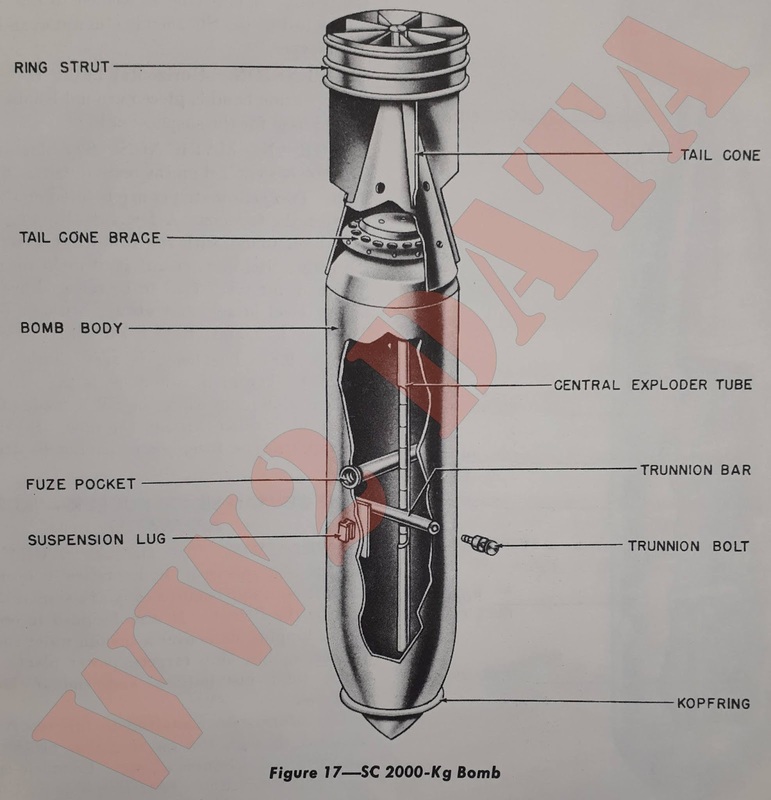 SA 4000 (Experimental) is a very large high capacity bomb. The loading factor is about 80 percent. It was never used operationally against the allies. Misc. Place Destroying Bombs. The aircraft-towed paravane bomb is a small 2-kg bomb towed by a plane. The plane destroying bomb is a small charge with a pull type igniter and safety fuze. Bombs which are carried in internal bomb racks (up through 500 kg) are usually colored dark green. Bombs which are carried in external bomb racks (1,000 kg and over) are usually colored sky blue. Color may also be controlled by the conditions of the bomb stowage. Aluminum, tan, buff, etc., are colors that may be used. 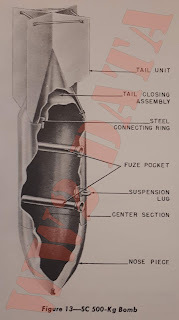 The fuze is located in an athwartship fuze pocket extending the full internal diameter of the bomb. The fuze is usually held in thje top of the fuze pocket by a locking ring and a locating ring. Threading into the bottom of the fuze is a steel case called the gaine. The gaine is filled with a PETN-wax mixture. A small pellet of lead azide and lead styphnate mixture is positioned in the top of the gaine. Tehse pellets may be of granular TNT. 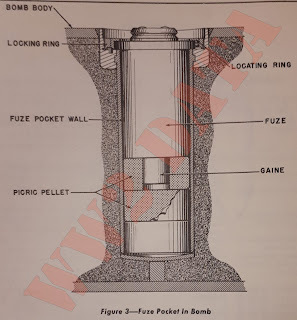 In bombs with powdered filligns, a column of granular TNT pellets is placed longitudinally in the bomb adjacent to the fuze pocket. Two tail types are used. The first type, a sheet steel tail, is usually made in four pieces to form a cone with four fins. The fins may be unbraced, braced with tubular struts, or braced with a cylindrical strut (ring). The second type is of magnesium alloy. The cone and four fins are cast in one piece. The fins may be braced with a cylindrical strut of the same material. Bombs up to and including some of the 500 kg type scan be suspended either horizontally or vertically. The remaining 500's and all larger types are suspended horizontally. All vertical suspension is by an eyebolt threaded into the nose of the bomb. Horizontal suspension is by an eyebolt for the 50kg series, either an eyebolt or a threaded T-type lug for the 250kg and 500kg series, and by means of an H-type lug for the larger series bombs. 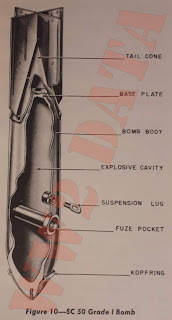 The H lug is secured either to a carrying band or directly to the bomb body. The SC 1000 and SC 1200 type bombs have been using a U bolt secured to the carrying band on the latest models. 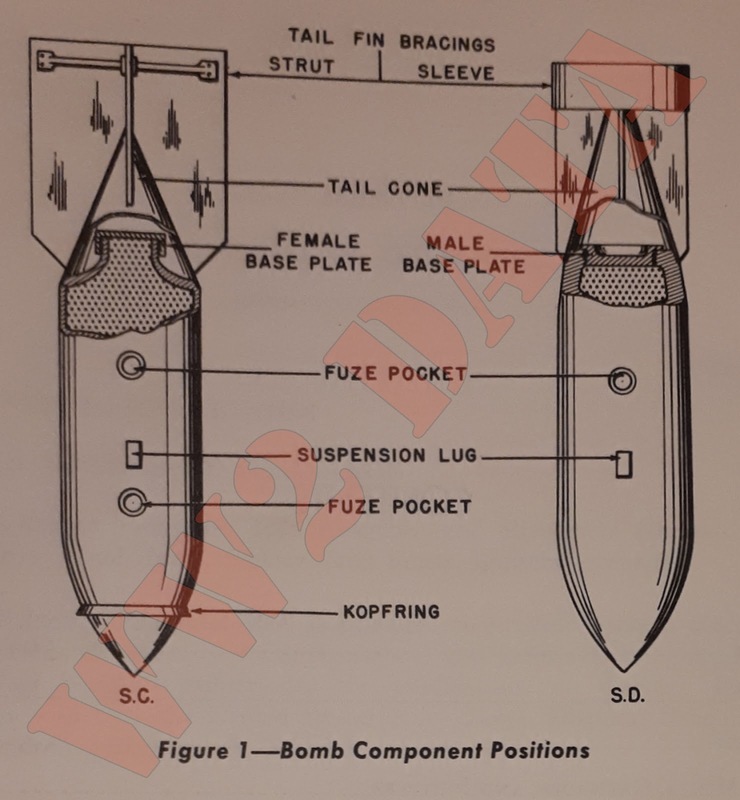 Kopfrings (nose rings) are sometimes fitted to the nose of SC bombs to prevent excessive penetration against land targets and to prevent ricochet against sea targets. 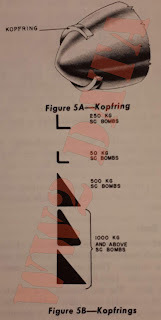 Kopfrings may also be found on the SD 70 and SD 1700 bombs when they are used against above-mentioned targets. 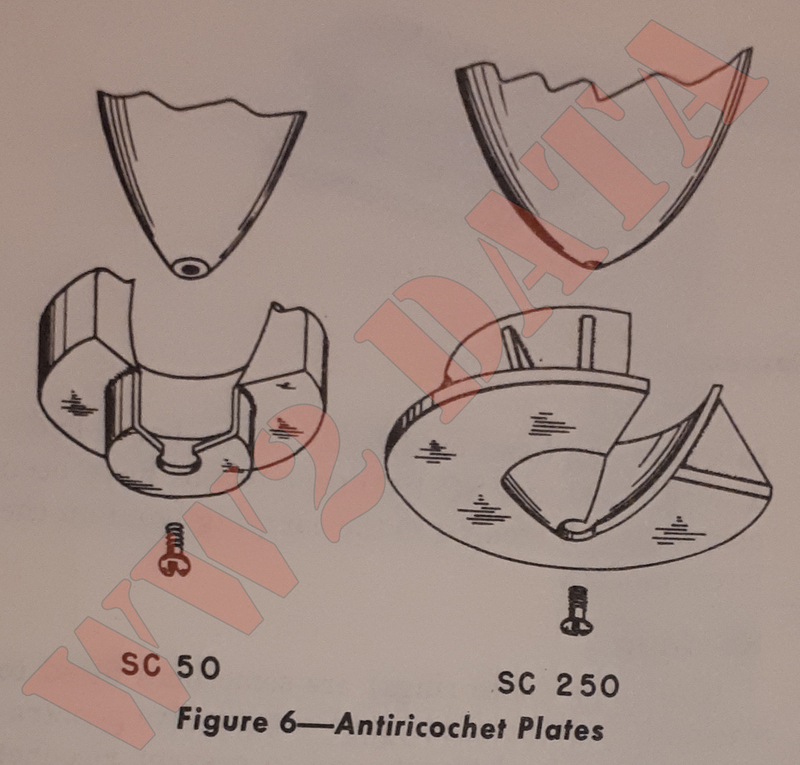 The anti-ricochet plates are used for the same general purpose as the kopfring but are entirely different in construction. Type I, which is used only on the SC 250kg bombs, is constructed of a conical cup and a dished plate welded to it. 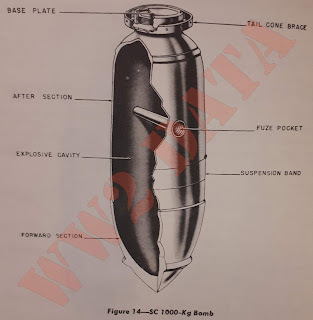 The conical cup is of 3/16 inch steel and designed to fit as a sheath over the nose of the bomb. A dished plate, 10 inches in diameter, fits over the cup and is welded to it. Eight stiffening ribs, also of 3/16 inch steel, are welded between the plate and the cup. The entire assembly is attached to the nose of the bomb by means of a threaded bolt which passes through a hole in the apex of the cone. Type II is used on the SC 50kg bombs. A circular plate, 5 and 3/4 inches in diameter and 15/16 inch thick, is machined conically to fit over the nose of the bomb. Welded to this plate is a circular cup, 2 and 11/16 inches in diameter and drilled centrally to take a bolt for securing the entire assembly to the bomb. Dinort rods are secured to the nose of the SD type bomb and used to obtain a "daisy cutter" effect on impact. 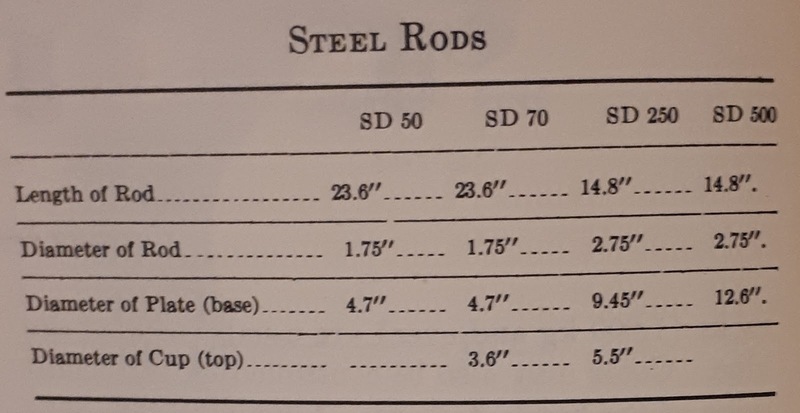 There are two types: steel rods and wood rods. 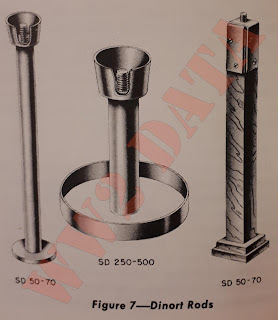 Steel Rod: The rod consists of a drawn steel tube with a circular steel plate welded to the base and a steel cup welded to the top. A threaded lug is welded to the upper end of the tube and passes through a hole in the cup. This lug screws into the suspension lug socket at the nose of the bomb. Wooden Rod: The rod consists of the square, center stick with two square pieces of wood nailed to the base. Two U-shaped steel plates welded together are secured to the upper end of the main member by light woodscrews. A bolt, welded to the plates, is threaded to screw into the nos suspension lug socket at the nose of the bomb. 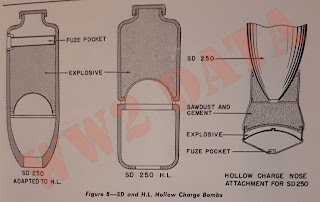 Construction: In SD 250 bombs having a hollow charge, the cavity is semicircular in section. The cavity in the SD 500 is a truncated cone, the larger diameter being 30 cms and the smaller diameter, 11 cms. The HE charge has a metal lining for the cavity which is supported on a flange and in order to permit the formation of the jet, the flange is located at a distance from the nose for the bomb approximately 1.5 times the diameter of the cavity. The opening at the nose of the bomb is approximately 5 and 1/4 inches. The 250 HL will penetrate 35 cms of armor plate. The 500 HL will penetrate 62.5 cms of armor plate or 350 cms of concrete. The performance figures for the 800 HL are not available but it appears that with an HE charge of 110kg it was hoped to penetrate 100 cms of armor or 6 meters of reinforced concrete. They are generally filled with amatol 50/50 or 60/40. 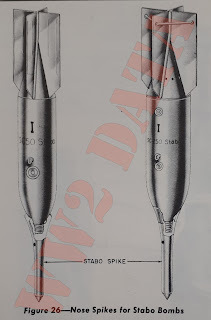 The special nose device for use with SD 250 bombs consists of a hollow charge which is to be attached to a bomb of standard type. This charge which weighs about 4kg is detonated by its own fuze located int he nose of the device. In order that detonation of hollow charge shall not damage the bomb, the space between the charge and the bomb is filled with a mixture of sawdust and cement. Remarks: Details of these types were obtained from documentary evidence only. 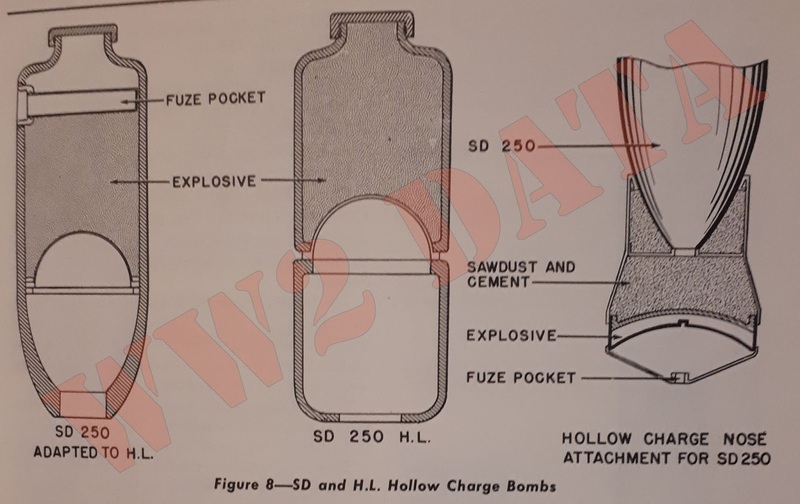 The SD hollow charge bomb proved disappointing in performance and modifications were made which resulted in the production of the HL type of bomb. The special nose device for the SD 250 obtains greater penetration power from low altitudes. It produces a hole in the armor through which the bomb can pass. Bomb has a short delay fuze so that detonation of bomb will occur inside the target. Documents state that such a bomb will penetrate 7 cms of armor plate. 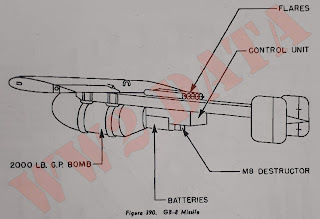 General: GB-4 is a glide bomb which is launched from an aircraft and guided by remote radio control to its surface target by employing television intelligence picked up by a television camera on the missile and radioed to a receiver in the launching plane. It has a special plywood airframe built around a 2,000-pound bomb, with rudders and elevators but no ailerons. The airframe is fastened to a magnesium casting threaded to the tail of the bomb. The missile is effective against well defined point targets, easily distinguishable from the surroundings on a television screen, and has an average circular error of 200 feet. At present, the weapon can be used only under good visual bombing conditions, but it has been proposed to incorporate radar tracking of the missile by the parent aircraft to alleviate the handicap. It is launched outside the normal anti-aircraft range from either a B-17 or B-25 at 175 mph at a preferred distance of 17 miles from the target at an altitude below 15,000 feet. With a glide ratio of 6 to 1, the time of flight, at average rates of 250 to 300 mph, is four minutes. Control: The television camera mounted under the bomb is set to point along the bomb's flight path, the standard setting being 3 degrees below the axis of the bomb. The field of view is 14 degrees wide and 18 degrees high. The camera scans the area and modulates a transmitter with the picture which is broadcast to the parent aircraft. The radio control signals are transmitted by a "liaison" transmitter in the parent aircraft and are received by a standard or command set receiver installed in the glide bomb. A modulator installed int he airplane will put out any one of the five audio tones to modulate the transmitter. The relays in the control unit switch current to the elevator servo motor and the rudder capstan motor to move the control surfaces in the desired directions. In addition, two more relays are actuated to shift temporarily the gyro pick-offs either to the right or to the left when those signals are given. The missile is stabilized by a directional gyro to give roll and azimuth control. Suspension: The missile is carried outside the plane on a Shackle D7. Electrical cables, connected to it, pull out on release. Destructor: The Destructor T9 is placed in the control box and is actuated, on impact, by the Fuze T62. 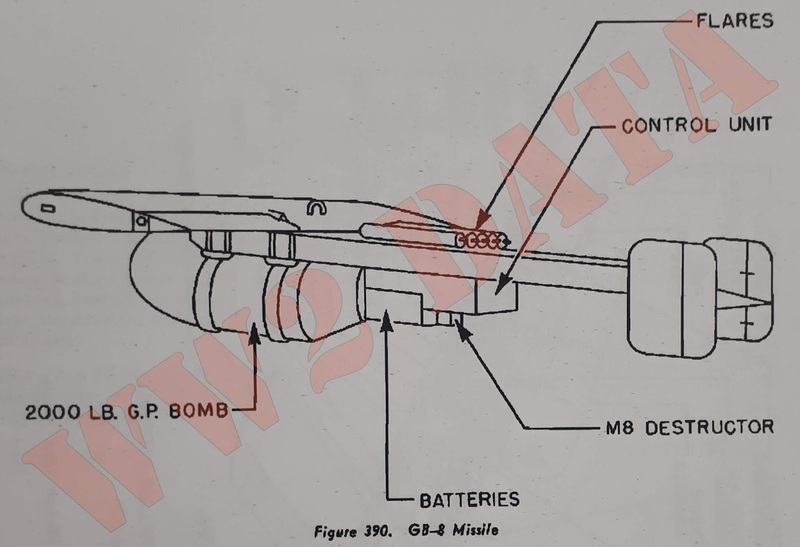 General: This is a radio-controlled glide bomb, with flare observation, designed for use on large installations. The wing is covered with plywood and is bolted to the boom assembly. The two spar booms are of solid poplar and have hinged bands attached to their front ends which secure the bomb to the frame. The elevator is covered with metal to prevent damage by the flares. The GB-8 should be launched with the parent plane on a bomb run when the target is at bombardier's angle of 75 degrees - which is still outside normal A.A. range at altitudes from 10,000 to 15,000 feet. It will glide at speeds varying about 6 to 1 depending on the elevator setting. Control: The guiding system consists of a radio control link from the plane to the missile, servo connections to the control surfaces, gyro stabilization, and a flare panel of five Flares T3 and T4 (white and red) for observation. Control surfaces are the ailerons on the wings, the elevator surface, and a single rudder on the left vertical stabilizer. Suspension: The missile is carried outside the plane on a Shackle D7. A warm-up electrical cable pulls out on release. Destructor: The Destructor M8 mounted under and tot he starboard of the control compartment is actuated, on impact, by the Fuze M121. General: The JB-2 and "Loon" are copies of the German V-1, with modifications. As far as the ordnance components are concerned, the Army and Navy modifications are the same. Warhead: The warhead is an aluminum-encased charge of Tritonal. The case is 3/8-inch thick and is bolted to the fuselage abaft the nose piece by four lugs. Destructor (T15): At the appropriate distance from the target, as determined by the Veeder Root Counter, an electrical contact is closed, which sets off the electric blasting caps int he Destructor T15, igniting the small charge and blasting apart the two junctions in the wing spar. The spar breaks; the wings come off; and the missile is forced into the dive toward its target. Previously, the missile was put into its dive by the action of the Spoiler Actuators T1. These were small steel bullet-like cups filled with black powder and an electric squib. When activated by the Veeder Root Counter, they were fired down two vertical tubes in the tail section, releasing a spring-loaded knife arm which cut the rubber hoses from the servo motors to the controls; and, at the same time, the spring pulled the elevators down, putting the bomb into its dive. Remarks: This missile uses liquid oxygen as fuel, this oxygen being highly explosive.